Not a month goes by that we don't hear about someone being kidnapped by aliens, or, worse, saw little green men land and eat a field of corn. There are always sightings of UFO's, and, of course, the one major controversial; issue remains "unsolved: The incident at Roswell, New Mexico in 1947. But, from a scientific point of view, in our solar system chances of life seems nearly impossible. And, we're not talking about little green men or some other living creatures, but rather, fossil remains that might be evidence of life having once existed. Mars, closest to Earth, is always a "suspect." "The evidence for life on other planets is slim to the point of non-existence. The discovery of polycyclic aromatic hydrocarbons in a meteorite fragment supposedly from Mars... is headline-grabbing stuff.... The normally cautious journal, Science, decided to... relax its usual news-embargo rule and allow the scientists to talk about their findings on Aug 7, well before the planned publication of the report on Aug 16. But does probing inside a meteorite and finding organic molecules and other imprints of primitive and ancient bioactivity prove that there was once life on Mars (the planet is now far too cold)?" While there are many who say "Of course not!" final proof is still not totally confirmed. What we should consider is not necessarily that there is now valid proof that there is some sort of life outside the Earth, but the possibility that there is some sort of life. "The expectation that extraterrestrial intelligence exists derives from two facts and one assumption: (1) the universe is vast, with hundreds of billions of galaxies each containing hundreds of billions of stars. NASA alleges there are zillions of uncountable stars. This number is so large that even if the emergence of intelligence is improbable, such intelligence could still have arisen frequently. (2) The physics and chemistry of the universe are everywhere the same. This is known from astronomical observation. (3) Habitable, Earth-like planets of the type that might spawn intelligence, with thick atmospheres and liquid water on their surface, are not extraordinarily rare. This is a hypothesis, sometimes called the principle of mediocrity. According to this principle, the Earth is not extraordinary in any of its important properties"
As new, more powerful search instruments scan the universe, the possibility (if not the probability) that there is life out there somewhere, is still a major topic of discussion: "The Hubble Space Telescope may have discovered as many as 100 new planets out beyond our solar system orbiting stars in the Milky Way galaxy, astronomers say.... Astronomers are coming to believe that almost every sun-like star in the galaxy, and probably in the universe, is accompanied by one or more planets like our solar system, vastly increasing the chance that some form of extraterrestrial life could exist". NASA is not the only organization looking for some sort of extraterrestrial proof. "More surprises are almost certain to follow if astronomers find more and more planets circling other stars. But while finding new planets of any sort is terrifically exciting, says Alan Boss, an astronomer at the Carnegie Institution of Washington, "the Holy Grail is to find an extrasolar planet that is capable of supporting life." Most scientists involved in the search have never said DEFINITELY NO to the possibility of extraterrestrial life. But, so far there is no positive proof. The ordinary citizen, when he hears the term "Extraterrestrial" immediately thinks of some weird human-like form (i.e., the Martian "green men), but chances are when and if life is discovered elsewhere in the Universe it may very well not have a form or shape anything like human life on Earth. Last month a newspaper article reinforced this "non-human" fact: "Bad news, Star Trek fans: If there is life on other worlds, it probably doesn't look like a swimsuit model. A scientist at Washington State University says the first extraterrestrial life we find is likely to be single-celled organisms surviving in a moon of Saturn, or the atmosphere of Venus. And not a Borg Queen in sight. Dirk Schulze-Makuch recently co-authored the book "Life in the Universe," in which he and Louis N. Irwin of the University of Texas-El Paso theorize on where humans should look for signs of other". So, if we continue to look, what sort of "life" might we expect? "If extraterrestrial life exists in our Solar System, it is probably no more advanced than bacteria. In recent years, biologists have discovered bacteria on Earth living in conditions that were once thought too hostile for life, for example in Antarctic ice, in super-hot ocean vents, and in rock deep in the Earth. These types of bacteria are called extremophiles, because they love extreme conditions like heat or acidity or saltiness". Even here one realizes that the expectations that "life" is another humanoid form would be a mistake. "What would aliens look like?...Would we expect the same (as human form) on another planet- in other words millions of species but only one with high intelligence?". What is of interest here is that Parker, and others, consider Man on Earth to be the only species with high intelligence, and therefore, even if some life forms would be found in spacer, would they have intelligence or be, as the Earth was at its origin, simple one- or two=-cell life forms which eventually developed into something of a higher power. While some scientists look to other solar systems, there are those who still try to determine if any planets in our solar system are "habitable." "Our own solar system contains four terrestrial planets within the inner part of the solar system. 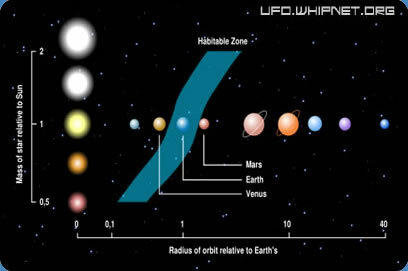 Three of these planets provide substantial clues as to what might determine the boundaries of the habitable zone". He believes that Venus may be too hot for water, a necessity for any sort of life form. Mars, he speculates "appears to have been within (the habitable zone) during its early history". His point, as it is for many astronomers and other biological scientists is that we are too early in our understanding of the universe to see where and if life exists. "Many, if not most scientists today believe that it is very likely that life exists on planets other than the Earth". It is important in this discussion to realize that "life" is a relative term. And, therefore, it is important to reiterate that we may never find any sort of human-like form, as Parker considers it- a higher intelligence life form. So, Parker makes a good point: What should we look for, given the possibility and even eventuality that we may discover some sort of life form in the universe outside Earth? No one has dared to make an educated guess. A skeptic may well argue: "So what? What would it mean to discover some sort of life form outside of Earth?" His reasoning is that it would neither improve the quality of our life nor would it do anything to reduce famine and disease, lengthen life-spans or make oppressed people free. So, why do we spend millions to determine if there is life out there somewhere? There is no reasonable answer except to state that science is made up of curiosity, and the desire to find out for sure that life exists somewhere else in the universe drives hundreds of dedicated scientists to continue to search. There is another aspect to life elsewhere that needs to be mentioned: The supposed sightings of UFOs, the purported "visits" of aliens. "Several astronomers have pointed out that we may be the only advanced civilization in our galaxy...(and) if other civilizations have emerged; many of them would have emerged millions of years ago, perhaps billions of years ago. It is difficult to imagine what a civilization millions of years old could have accomplished. Considering what we have accomplished in only a few centuries". Parker then guesses that if the Earth did have alien visitors, it would have occurred tens of thousands of years ago, not in 1947 or more recently. That does make him right, only another one to do guess work. There are many experiments and investigations currently underway. Some we know about, others seem to be top secret. The goal is to either prove or disprove once and for all that there is- or is not- extraterrestrial life out there. The only thing we know for sure is that we don't know for sure. But, we continue to look. Whether in our life time, we will ever get a definitive answer is doubtful, given the limited funds and equipment available. So, we do need to ask ourselves: "If we find life elsewhere, how will it change our lives?"